Merton College is one of the colleges of the University of Oxford. It was founded in 1264 by Walter de Merton, who was the Chancellor to Henry III and Edward I. It claims to be the oldest college in Oxford, although Balliol College and University College also claim to be the oldest. Construction of the college at its present location began in the 1270s. Its buildings are among the oldest in Oxford. Mob Quad at Merton College was built in the 14th Century. 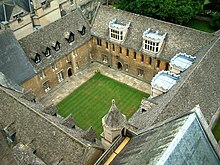 It is often said to be the oldest quadrangle at Oxford or Cambridge. Other quadrangles at Oxford and Cambridge, however, may be older. J.R.R. Tolkien was a professor of English Language and Literature at Merton College. ↑ Grotta, Daniel. J.R.R. Tolkien Architect of Middle Earth. Running Press. (2001) pp. 64–. ISBN 978-0-7624-0956-3. This page was last changed on 5 July 2018, at 04:02.